The President of the Republic addressed a message of condolences to the Family of the former Speaker of Parliament, Dr. António de Almeida Santos. "Upon receiving the news of the passing away of Dr. António de Almeida Santos, I address the bereaved Family my very deepest condolences. A man of causes, an advocate of freedom, António de Almeida Santos was distinguished by his qualities as an eminent jurist, and as the author of several structural bills of our democratic regime. He was always firmly faithful to the ideals and principles that signalled his life’s path, during which he exercised the highest State functions, with special regard to his duties as Speaker of Parliament. An exemplary citizen in his drive for the defence of the European model of democracy, Almeida Santos leaves, in all who had the privilege of his acquaintance, the affectionate memory of his cordiality and affability, of his admirable humanistic culture and of his rare endowments as a speaker and a defender of the Portuguese Language. You have gained access to the records of the Official Site of the Presidency of the Republic from 9 March 2006 to 9 March 2016. 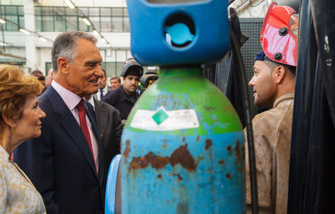 The contents available here were entered in the site during the 10 year period covering the two mandates of President of the Republic Aníbal Cavaco Silva.